If you’ve decided to get an aquarium because you love the mesmerizing effect of watching freshwater fish and other creatures, then you’ve likely picked out which creatures will be in it. We also hope you’ve found the appropriate fish tank for your needs. But have you given any thought to the many types of aquarium plants available for your fish? Perhaps you’re thinking you’re more of a plastic plant type of person; particularly if you’ve never had much luck with houseplants. Well, you may want to reconsider. And there are so many benefits to having real aquatic plants in your aquarium. First of all, they provide natural filtration for the water and help keep your fish healthy. They also serve to balance the aquarium environment, give it a natural carpet and conceal those sometimes unsightly fixtures. Plus, fish like to have hiding places. They’re also beneficial in the reproduction process, though since you’re new to this, breeding fish may not be up your alley just yet. Just something to consider down the road. In this post, we’ll give you the low down on seven of the best types of aquarium plants for beginners. You may have already been educated on the importance of setting up your tank with a cycling process so that the fish will survive once you put them in there. The good news is, with plants you don’t need to worry about this. Plants can be popped into the aquarium as soon as the water’s in there. As a beginner, there’s one basic rule of thumb. Stick with the basic green and inexpensive plants for now. Colorful plants usually need more direct light and without the expertise to provide this, you run the risk of messing up the temperature and algae levels in your aquarium. We’ll begin with four carpet plants that stay toward the front and bottom of the aquarium. This plant is about as easy as they come. Even if you have a poor record with houseplants, Java Moss is almost impossible to completely kill. That’s why it’s one of the most common plants you’ll see in aquariums. It’s a fast grower, particularly in medium light conditions. You’ll need to trim it early and often so that it doesn’t get overgrown and lose its carpet-like quality. It also needs to be anchored to something heavy, so that it won’t float to the top of your tank. Like the Java Moss, the Marsilea Minuta is another of the low maintenance types of aquarium plants. It has a clover appearance that carpets well and is very easy to grow. Also like the Java Moss, it will need trimming. This plant is versatile and nicely accents hardscape features such as stone and wood. This hardy little bushy plant from the Amazon has small green leaves and is great for carpeting in the foreground of your aquarium. It’s easy to care for and brings softness when placed around the hardscape or stones of your aquarium. It should be noted that this a heavy root plant and it spreads via side shoots. That means that it’ll grow a lot of roots before spreading visually. Cutting back the stems at this point will help to speed up this process. If you’re looking to give your fish the facsimile of a lawn, this is your plant. Planting Pygmy Chain Sword around your aquarium hardscape will soften the edges and give it a finished look. When planting Pygmy Chain Sword, you’ll want to use a powder-type substrate to get the best lawn effect. The granules will help the plant take hold and keep it from floating upwards. Once you’ve visualized what the floor and front of your aquarium will look like, you can begin to think about what types of aquarium plants you want more toward the mid and back part of your aquarium. These four plants are well suited for the middle or back of the aquarium. It would seem that Java is a popular place for easy-to-care-for plants. Much like the Java moss, you shouldn’t have any trouble keeping these alive. They also have a distinct look, with their large and broad leaves. Water that is 74-82 degrees Fahrenheit. These plants can really work in just about any part of your aquarium. But keep in mind that these plants can reach 8 inches tall once their full grown, so somewhere in the middle might be best. Anubias Nana is hard to kill. This plant thrives in virtually all conditions. What’s even better is it’s ability to produce that hypnotic stream of bubbles from its leaves. And since it grows well from trimmings, it’s easily propagated in an aquarium. With its curved stems and rounded leaves, this plant is ideal as a mid-level plant. There is a dwarf variety as well that can be used in the forefront. Water that’s 72-78 degrees Fahrenheit. It will often flower in the water and does well when tied to a stone or tree root for support. Simple to maintain and a fast grower, the Amazon Sword is commonplace in the world of aquariums with its long narrow leaves. The Amazon Sword can grow up to 20 inches. As a result, they’re most often planted in the mid-background area. They also serve to cover up plumbing, filtration systems, and other hardware. 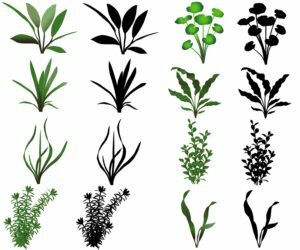 So there you have it, the types of aquarium plants that even the newest aquarium owner will feel comfortable planting. For the best advice on picking the right tank to get started, look to the experts at Aquatics World. We’re here to help.